From bold stripes to delicate embroidery, from bell shapes to slinky slim numbers: we’re shaking things up on Rate the Dress with a Titanic era gown with two formal bodice options. How will the rating shake out in comparison? Well. It got compared to a circus tent. Multiple times. And lots of you really, really don’t like tassels. And false fronts. And the purple was hardly universally popular – not to mention there were diametrically opposite opinions about which possible shade was better! Some of you even disliked it so much that I had to remove a comment because it veered into being mean and insulting to people who did like the dress. 🙁 Please remember to be respectful of other commenter’s right to have different taste from you in Rate the Dress. The fun is seeing how we all ‘see’ a dress: no one’s opinion is wrong. While most of you weren’t huge fans, it also got called ‘luscious’, and some of you thought it was really fun and vibrant and quirky – so it had its admirers as well. It had admirers, but they were an exclusive club! Since purple didn’t really work for you, what about pink? 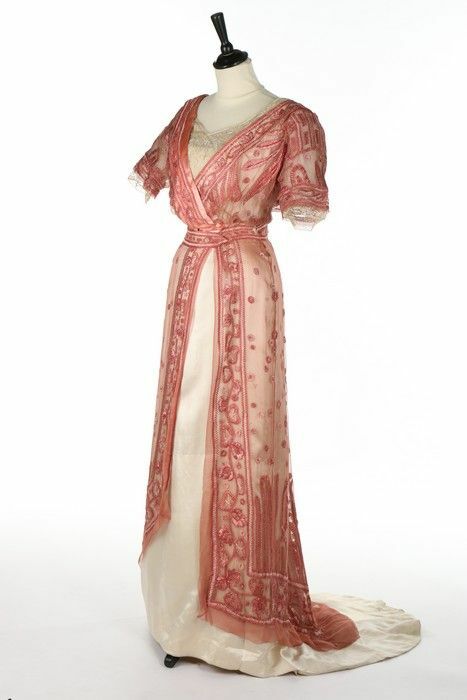 This Titanic-era concoction features white silk overlaid with pink chiffon embroidered with an unexpectedly abstract and modernist design. 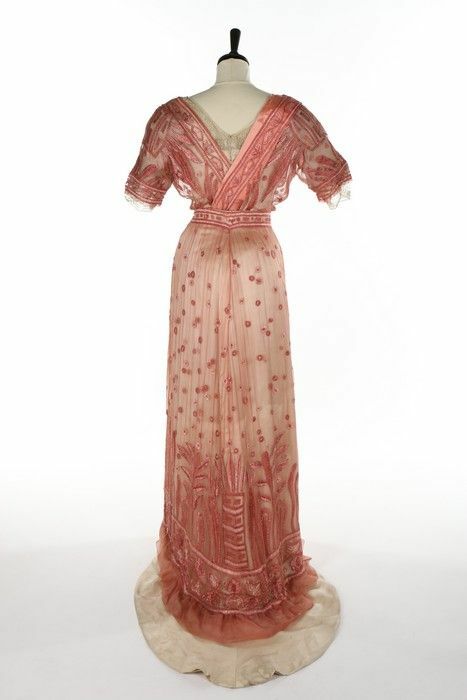 The dress comes with two bodices, described as day and evening by the auction house. The lush silk, beaded chiffon, and trained skirt still suggests a very elegant event. The day bodice, with its high lace collar, less-beaded bodice, and fichu-effect overlay, was probably worn for formal afternoon receptions, or extremely dressy garden parties – not just for relaxing around the house. 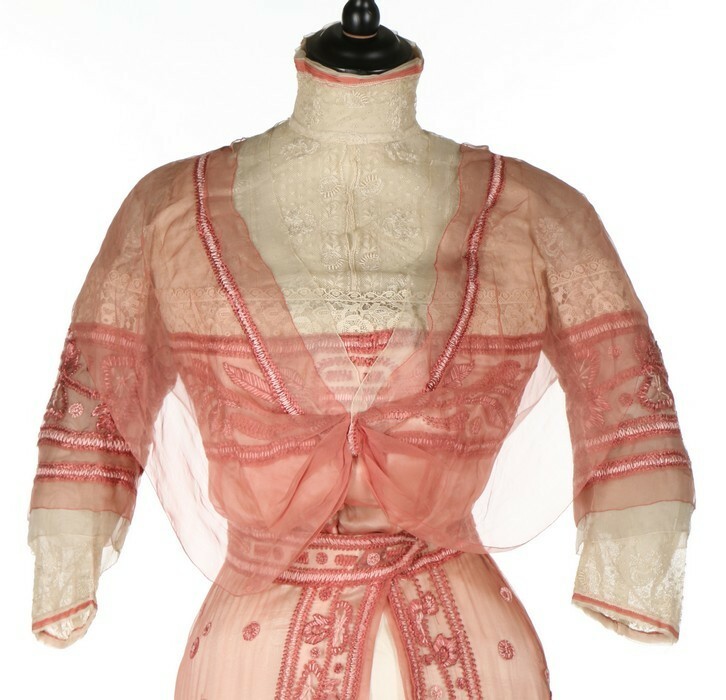 The evening bodice features shorter sleeves, a modest V-neckline which still revealed significantly more skin than the high collar of the day bodice, and a plunging overlay of heavily beaded pink with borders in pink satin – giving the impression of décolletage without any real exposure. What do you think of this Titanic Era twofer? Pretty in pink? Or an odd mix of modernity and missishness? And do you prefer the day or evening look? This is absolutely lovely, and I have a hard time choosing between day and evening bodices (but a slight edge towards day). Even though I’m not someone usually drawn to pink, I love this shade, which for me is more of an old rose. 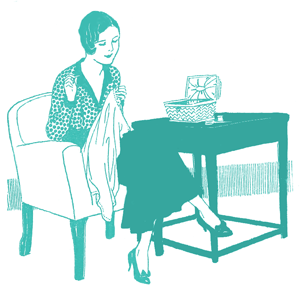 The strong linear elements of the embroidery rescue it from twee-ness. It reminds me of the Arts and Crafts home decor motifs (which is NOT to say that it reminds me of home furnishing fabrics. If I had the appropriate coloring (and figure), I’d wear it twice a day in a heartbeat. I love this. Prefer the evening look as I don’t care for the capelet sheer collar? 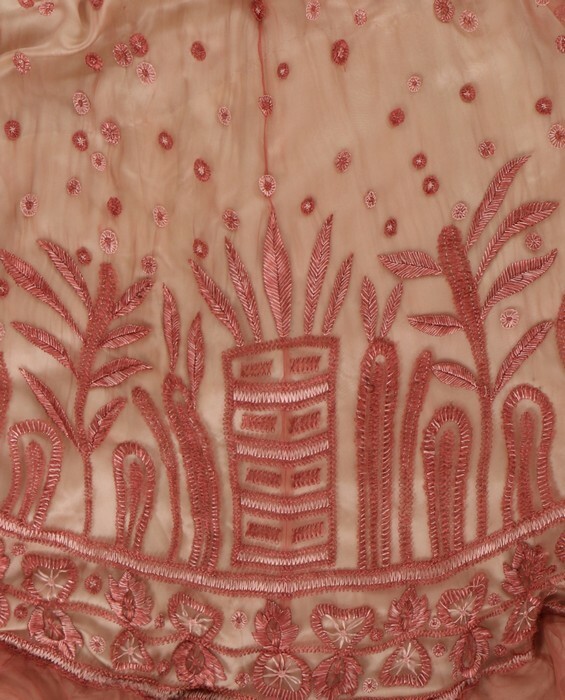 But over all I love the old rose color embroidered over dress /jacket & if it didn’t have the train would wear it now. I am a bit torn by this one, but only a bit; overall, I like it. For one thing, I have always been a fan of day and evening bodices, ever since I learned that that was a “thing” during the Victorian era. Second, it’s impossible to object to white with red (or pink, though it looks like a light red to me) as a color scheme, in my opinion. Both our lovely colors that work well together. Third, the embroidery of the overlay is exquisite. 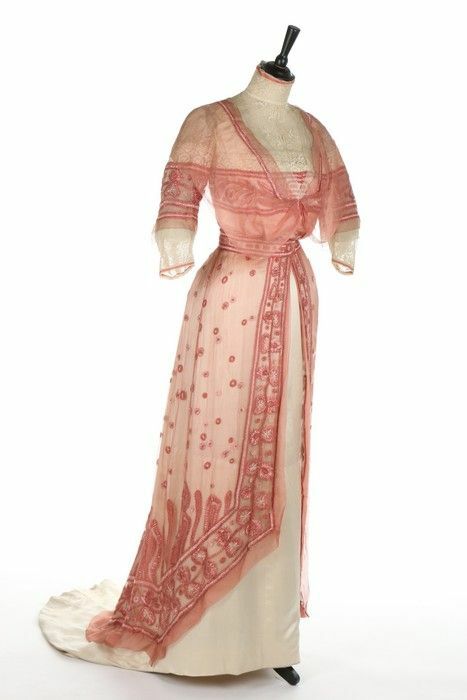 My only qualm comes from the fact that the red/pink tulle and embroidery, when seen over the white underdress, looks a bit odd to me, as though the embroidery is gleaming up at us through a layer of clear gelatin. But gelatinous or not, I think has the additional feature of looking daring without being especially so. This pink usually isn’t my favourite colour, but I think this dress is just lovely. The embroidery is rich without being overpowering, and I love how light and airy it all looks. It’s detailed without being overwhelming, and the pale underlay shows the detail really well. Such a gorgeous example of this era too. I’m afraid I like this even less than last week’s. It has a lot to do with the embroidery which though modernist looks sloppy to me. Although the blanket stitch wheels give an interesting effect which I can’t really decide what to think of. I would have liked to see the skirt from the front to know what to think of the assymetry of the overskirt. I like the day bodice better, don’t really like the neckline of the evening one. Oh, it’s fun and sly, while still being quite demure. The quiet girl who makes the wittiest remarks that only those near her here. I really like it. 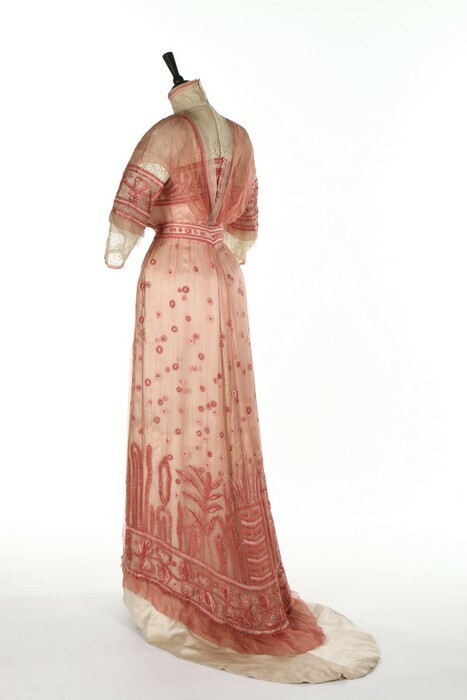 There’s a hint of influence from Poiret’s asymmetric closings, but in a genteel way. This is solidly in style, even slightly fashion forward, without risking one’s reputation. Beautiful! I have no major complaints with this dress! Delicate pinks are my second favorite color group (yeah, I’m an artist…I have favorite color groups) after summer-sky and other tropical light blues. Only the weird V neck in the back of the evening bodice keeps this from being a perfect 10. I know it was fashionable then but it just looks wrong to me. I absolutely hate this. Sure, the colors great. The hem detail is nice. Im sure its well made. But what in all the gods great hells is going on with that sheer mess? I cant see the damn thing, and since I saw it on IG first, I spent time cleaning my phone screen and then my glasses trying to remove the smear blocking the bodice. Only to see, upon inspection, its intentional? I give it a 2 for the hem design and nothing else. Beautifull embroidery and I like to have two bodices with one dress. It would be great to have an inside view, how the connection between the skirt and the bodices are made to match both options. I prefer the day bodice with the cape like sheer collar. So airy and subtile. The color is not mine, but this will not affect my voting. Delightful. I prefer the day bodice, it’s much cleaner looking. Lovely embroidery that seems to have a slight Egyptian theme to it, when Egypt was wildly popular (my Great-Grandfather was working in Egypt around 1910) . The asymmetry is pleasing rather than jarring, the colour is perfect, it’s beautifully delicate. I prefer the evening bodice, just because I hate the feel of a very high neckline myself. Love it! Feminine and delicate……exquisitely presented. If I still had the body then even at my advanced age……I would wear the gown. The dress with the evening bodice and the front of the day bodice is a bit bland for me. Pretty enough, but I probably wouldn’t look twice at it in a room full of women in pretty dresses. However, I think the back of the dress with the day bodice is spectacular! It would definitely get a second glance from me! It’s a nice dress, but it doesn’t make me squee. It feels quite ordinary, despite being so detailed. I prefer the day bodice, I think the embroidery on the evening bodice is too heavy compared to the skirt. A bolder colour than pink would have made it much more interesting. 10 of 10. It’s elegant and I love the train. 10/10. I’ve died and gone to heaven. I love it! The color, the cut, the whimsical exuberance of the beading. 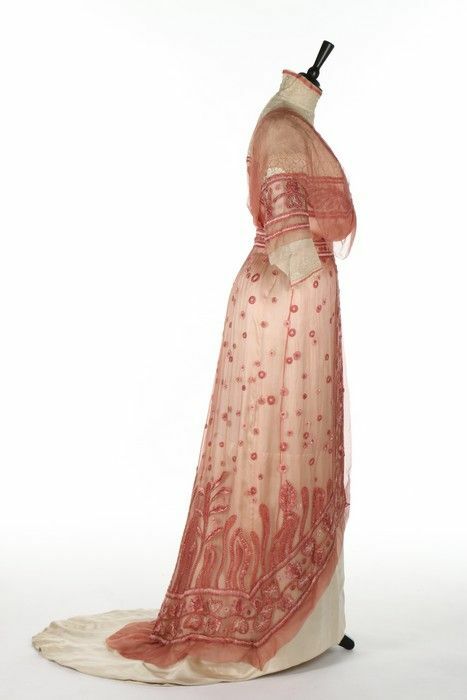 If Princess Bubblegum lived in the Edwardian period, this is what she’d wear. Drool, drool. So beautiful. At Te Papa Museum some years ago, I saw a wonderful exhibition with costumes from the Kyoto Museum of Fashion on the Japanese influence on western fashion. Superb. I learnt so much. 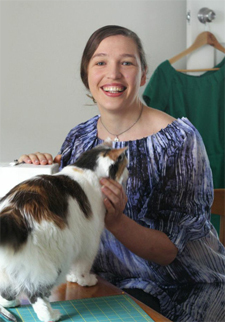 This beautiful dress is an example, with the cross-over bodice version at the front and back. Thanks for sharing this wonderful creation with us. 10/10. Lovely on all counts. I would have loved to wear this dress! I can’t quite decide whether the embroidery reminds me of seaweed, in which case I like it, or the kind of abstract designs you used to see on 1990s furnishing fabrics, in which case I may have a problem with it. 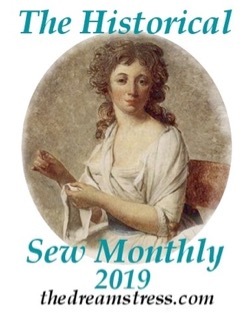 While I rather like the evening bodice, the day bodice doesn’t appeal to me as much – maybe I’d like it better if I could see it in motion on a person. Actually the embroidery reminds me of laurel leaves, which gives a resonance of Classical Greece to the gown, but combined with the circular motifs (which look like bubbles) the seaweed hypothesis makes more sense. Gosh, seems like all the elements which would please me but I am underwhelmed. Evening version is better. The dress just doesn’t come together for me despite all. It’s a limp disappointment. It feels like there was some other sort of overlay, that met with a scone with jam accident resulting in its ruin. This chiffon gauze overlay was then hastily purchased, whilst on holiday, to save the wearer’s wardrobe. But my speculation of these dresses is always good fun. It underwhelms in decoration, color, and it seems like a poor fit. I like both bodices equally well. However, I have a couple small niggles about both of them. I don’t care for the front of the capelet, and I’d like the back of the evening bodice more if the skirt picked up the asymmetry. The embroidery is attractive and pink is my favorite color so no quarrel with that. 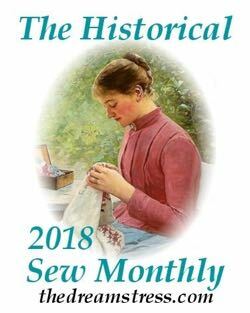 I love the colors, I love the embroidery, I love the time period. I love the evening bodice. I love the various sleeve treatments. I love the train. But what’s going on with that chiffon overlay capelet with the daytime bodice? No. The rest of that bodice is lovely. The capelet just doesn’t jive, it’s not detailed enough. It cheapens the rest of the look. And that is a pity. Lovely, I like the evening version best, only because I don’t like those high neck Edwardian dresses. Not my colours but I’m not judging it on that. I really love this dress! Even though my immediate reaction was that it was made of a (very impractical) tablecloth, the entire thing is very pleasing, and the details are lovely. Quite lovely, especially the embroidery on the pink over-layer. I do wish the pink layer covered more of the white satin of the skirt in front, though. The way it separates below the belt seems, somehow, unflattering. My preference is just slightly on the side of the day bodice, because I enjoy the horizontal band across the bodice and sleeves and because I love all of that delicate lace at the cuffs, collar and decolletage.